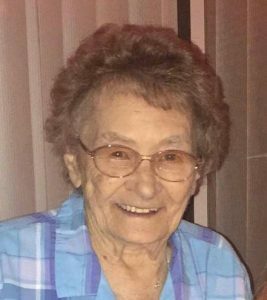 Elsie Ratkovec, 92, of O'Neil, Nebraska, died Friday, May 20, 2016, at her daughter' s home in Henderson, Nevada. Saturday, May 28, 2016 10:30 A.M.
Visitation Friday 4-7 P.M.--Rosary Service 7 P.M.
Elsie (Kracl) Ratkovec, age 92, of O'Neill, Nebraska passed away Friday May 20, 2016 in her daughter's home in Henderson, Nevada. She was surrounded by her family Monica, Dan, Alicia, Amanda and Misha. Elsie was born July 23, 1923 in Schuyler, Nebraska to Louis Kracl and Francis (Slavik) Kracl. Her family moved to Cedar Bluffs when Elsie was 12 years old. After her mother passed away she stayed on the farm to help her dad and brother Bill. She moved to North Bend with her dad in 1958 and worked at Watts Store and Campbell's. She worked and co-owned Lumir's Bar for 17 years. She moved to the farm in O'Neill, Nebraska in 1979 where she was involved in farming and cattle. Elsie enjoyed spending time with her family and friends and loved to cross stitch. Of which she had made quilts for all 12 of her grandchildren, several of her 11 great grandchildren and numerous quilts for family and friend's. Elsie was preceded in death by her parent's, brother's Bill and Eldon Kracl, sister Helen Holmes, son Alan (Skeeter) Ratkovec and great granddaughter Tina Ratkovec.